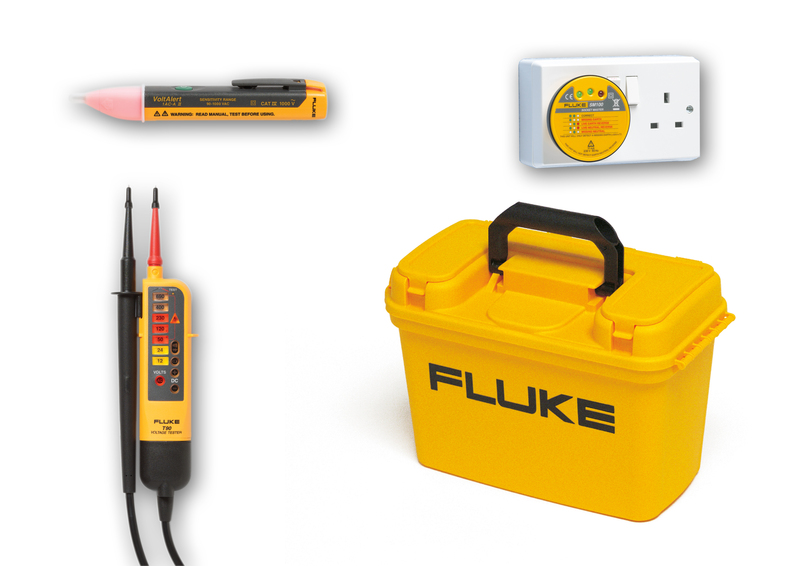 Fluke, specialist in electronic test tools and software, has introduced an ‘Electrician’s Basics in a Box’ kit which has been created by the company to provide the key tools needed by new and trainee electricians. The Fluke Student Kit (FLUKE-STU-KIT) comprises a Fluke T90 Two Pole Electrical Tester, a Fluke SM100 Socket Tester and a Fluke 1AC Non-Contact Voltage Detector, together with a Fluke C1600 Toolbox to carry these and other tools. The two pole T90 Voltage/Continuity Tester offers a number of ways to indicate AC/DC voltage: a clear, instantly visible LED indicator, an audible continuity test, and vibration to provide tactile feedback so electricians know there is voltage present – which is especially helpful in noisy environments or when they cannot take their eyes off the probes, says the company. With a CAT III 600 V and CAT II 690 V safety rating, the T90 features high-quality construction, including a heavy-duty moulded case, thick wiring with WearGuard wear indicator, a sturdy battery case and durable probe protector. Fluke has designed the SM100 Socket Tester to be easy to use. It simply needs to be plugged in to a socket and the autotest function indicates wiring status by a combination of LEDs. The 1AC-II VoltAlert Voltage Detector has a 200V to 1000V AC test range and provides an audible beep, as well as a visible red glow at its tip, when a voltage is detected. The user just needs to touch the tip on a terminal strip, outlet, or power lead to test the presence of a voltage. The 1AC-II VoltAlert has a Category IV 1000V safety rating and continually tests its battery and circuit integrity to further ensure user safety, providing a periodic double flash to indicate that the tester is functioning correctly. The C1600 Toolbox features a large, deep interior to hold these and other products. The toolbox also offers a rubber gasket in the lid to minimise dust and water ingress, a lift out tray for storage of smaller items and five hook and loop straps to wrap cords and test leads when not in use. The Fluke Student Kit is available until December 31, 2017, more details are available direct from the company.